I have the best family in the world! I’ve been married to the love of my life for 30 years. 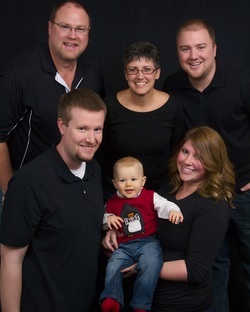 We have a wonderful son, daughter and son-in-law, two beautiful grandsons, and another grandchild on the way. I've always felt so blessed; even though times weren’t always easy, we always had each other to count on. The support they have given me so unselfishly has helped in so many ways that “thank you” seems small, especially to my husband. December 31, 2009 I had a spinal fusion to repair a ruptured disc. I started noticing some symptoms that didn't seem right. I knew something was wrong, but my surgeon could explain away all my symptoms. April 22, 2010 I went in for my annual exam and my gynecologist found "something" and sent me to a colorectal surgeon. April 29, 2010, at the age of 45, the biopsy came back: I had stage III rectal cancer. And so began the fight. We were about to embark upon the hardest two years of our marriage, but strangely the best. I started a Care Page to keep my family and friends updated on my journey. The outpouring was astounding. It was strange; I knew I had a lot people in my life that cared about me, but getting all that encouragement every time I posted something was truly amazing. I started oral chemo and radiation for 6 weeks in May, had a 6 week break; had the surgery to remove the tumor and put in an ostomy, then 4 weeks off to recover, followed by 17 weeks of chemo. I lost most of my hair, had to have a blood transfusion, and got neuropathy in my hands and feet (which I still have), but the worst of it was the thrush, constantly throwing up. Let’s just say it was a very long process. I couldn't wait to get the ostomy reversed in February of 2011. I hated that bag! It was the hardest thing for me to deal with during the entire experience. So, what I thought was going to be the best thing to happen in a year, the reversal of the ostomy, turned out to be a nightmare. Following the surgery I had a leak, but no one caught it. After 8 long months of pain, losing 45 pounds, and becoming addicted to pain pills, I was told, “Sorry, there's nothing else that can be done for you, you’ll just have to live with the pain.” I requested a referral to Mayo Clinic. That decision saved my life. For whatever reason, with the six CT scans I had, no one noticed an abscess the size of a baseball that was rapidly growing. It was getting dangerously close to the hardware in my back. I was told if I hadn't come to Mayo Clinic, the abscess would have killed me within a year. I ended up with a permanent colostomy from all the damage the abscess caused. My worst fear. I was terrified of it. What would that be like? Would everyone know? But, what choice did I have? It was better to be healthy and with my family. I'm still dealing with "being different" and probably always will. It's not easy feeling you're different. I still have days (and always will) where I hate my body because it betrayed me, but it gets easier with the love and support from family and friends. And now I’m cancer free!!! Right after I was diagnosed I was told about Get Your Rear in Gear. I told everyone I knew about the walk, got a team together and participated. I requested to put my story on the website and got a call from David McCluskey, co-founder of David’s Fight. He said he would put my story on the DavidsFight.org website, and a friendship began. He asked if I would like to help with Get Your in Gear, and I said yes! My husband and I really learned what David’s Fight was all about: Getting the word out about the cancer no one wants to talk about, making connections, and helping others going through this. And because of that, I’ve met some wonderful people and realized that I’m not alone. There are others fighting this battle with me against this terrible disease, and we’re winning, together. Having cancer has forever changed me. I am a different person, but I have learned it’s not all about me and my struggle; it’s about sharing my story to help others. I’m not embarrassed to say I had stage III rectal cancer, because I am a survivor!